GETTINGREADYFORTHEHOLIDAY Ta'anit bechor ot (fast of t hef ir st bor n) is on Friday, April 19 at 6:45 A.M. in the J.B.Greenfield Chapel. The fast is broken with a brief study of Talmud with Rabbi Danny Horwitz, followed by a breakfast sponsored by 100 Jewish Men. All first-born (including children) are urged to attend this beautiful service. takes place during Passover Services on the last day of the holiday, on Sat urday, April 27, 9:30 A.M. in the Freedman-Levit Sanctuary (8:30 in the Greenfield Chapel, 9:15 in the Museum Minyan.). A Yahrzeit candle should be lit on the night before. It is meritorious to make a donation to the synagogue in memory of your loved one(s). Br it h Shal omJoins us f or 2nd Day! We?re happy to welcome Brith Shalom to celebrate Pesach with us! As you clean your hom e at Passover , r em em ber the poor and hungr y in our com m unity by br inging your unopened packages of ham etz to the synagogue befor e Pesach begins. All food collected w ill be taken to the Houston Food Bank . pr epar ing your kit chen f or passov er Preparing one's home for Passover is a major part of celebrating the holiday. In anticipation of Passover, we strive to clean our homes thoroughly, to remove from them all traces of hametz [leaven] in fulfillment of the Torah's injunction. In addition to the following procedures for "kashering" (making utensils and appliances that we use year-round usable for Passover), families typically take extra care in cleaning their homes in order to create within them a true "Passover feeling: This extends to a careful cleaning of the refrigerator, stove and oven, microwave oven, sink and counters. Many people go further and seek to remove hametz which may have fallen into sofas or under furniture, or which may be in coat pockets or cars. Most people maintain separate dishes and cooking utensils just for Passover use. EARTHENWARE: (china, pottery, etc.) may not be kashered. However, fine translucent china which has not been used for a year may be used if scoured and cleaned in hot water. METAL: (wholly made of metal) must first be thoroughly scrubbed and cleansed, and then made as hot as possible. Those used for cooking (silverware) must be thoroughly cleaned and completely immersed in boiling water. The utensils should not be used for a period of 24 hours. OVENS AND RANGES: every part that comes in contact with food must be thoroughly cleaned. Then, oven and range should be heated as hot as possible for one hour. 3 days, changing the water every 24 hours; (b) Thoroughly wash each glass by hand or in the dishwasher. Either opinion is acceptable. DISHWASHER: after not using the machine for a period of 24 hours, the empty dishwasher should be run through a full cycle with detergent. ELECTRICAL APPLIANCES: appliances and/ or parts that have come into contact with hametz or been washed with hametz dishes must be kashered for Pesach: if the parts that have come into contact with hametz are removable, they can be kashered by immersing in boiling water or (if metal) by heat. If the parts are not removable, or would be damaged by kashering, then they cannot be used for Passover. GAS STOVE: all burners should be thoroughly scrubbed, then run at full flame for 15 minutes. Self-cleaning ovens should be scrubbed and cleaned and then put through the self-cleaning cycle. Continuous cleaning ovens must be kashered in the same manner as regular ovens. A MICROWAVE OVEN: can be made use-able for Passover. First, it should be thoroughly cleaned. Then a cup of water should be placed in it. The oven should be turned on for about 10 minutes. A microwave oven that has a browning element cannot be kashered for Passover. sink can be kashered by a thorough cleaning and by pouring boiling water over it.A porcelain sink should be cleaned and a sink rack used. If, however, dishes are to be soaked in a porcelain sink, a dish basin or tub must be used. HAMETZ & NON-PASSOVER UTENSILS: should be separated, locked up or covered, and marked where necessary so as to prevent accidental use. TABLES: should be thoroughly cleaned and used only with a tablecloth. Tablecloths, rags and towels used year-round may be used during Passover after being cleaned in a washing machine. In general,it is usually easier to have separate dishes, cutlery and small appliances set aside from year-to-year and used solely for Passover so that the below kashering procedures can be minimized. 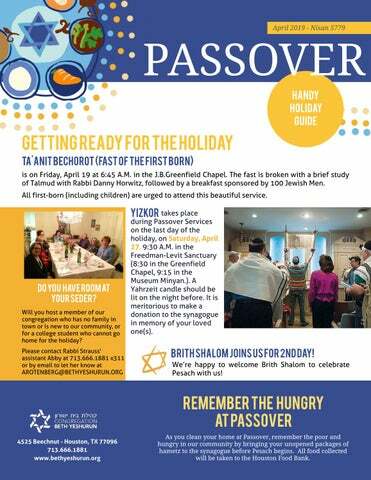 Once you have prepared your home and celebrated the beautiful rituals of the Seder, complete the Passover Experience by coming as a family to synagogue on the first morning of the holiday, April 20, 2019. Join with your Rabbis, Cantor and fellow Jews in the sacred and joyous celebration of one of Judaism's most beloved holy days. Since the Torah prohibits the eating of hametz during Passover, and since many common foods contain some admixture of hametz, guidance is necessary when shopping and preparing for Pesach. While many Jews adhere to the same rules for buying Passover foods before and during the holiday, Jewish Law actually draws an important distinction. Certain leniency's are permitted for some foods if they are produced before Passover begins. Still other foods must adhere to the same standard irrespective of when they are produced. The following guidelines, prepared by the Conservative Movement's Committee on Law and standards, clarify these possibilities. honey,frozen (uncooked) vegetables (except legumes, as above), milk, butter, cottage cheese, cream cheese, fresh fruit and vegetables, kosher meat and poultry (fresh and frozen) and fish, baking soda, frozen (uncooked) fruit (with no additives), ripened cheeses (such as cheddar, muenster and Camembert), baking soda, 100% pure saccharin tablets (not powdered sweetener packets). The following foods require no "Kosher for Passover" label if purchased before or during Pesach: Fresh fruits and vegetables (for legumes, see above), eggs, fresh meat and fresh fish, as well as all detergents, cleansers and scouring powders that are certified kosher year-round. The following foods require a "Kosher for Passover" label if purchased before or during Pesach: All baked products (matzah, cakes, matzah flour, farfel, matzah meal and any products containing matzah), canned or bottled fruit juices (which are often clarified with legumes), canned tuna (since tuna, even when packed in water, has often been processed in vegetable broth and/ or hydrolyzed protein; however, if it is known that the tuna is packed exclusively in water, without any additional ingredients or additives, it may be purchased without a kosher for Passover label), wine, vinegar, liquor, oils, dried fruits, candy, chocolate milk, ice cream, yogurt, soda. The following processed foods (canned, bottled or frozen) require a "Kosher for Passover" label if purchased during Pesach: milk, butter,juices, vegetables, fruit, milk products, spices, coffee, tea, and fish. Medicine: If a particular medicine is mandated by your physician, it not only may but must be used on Pesach. If not, it should only be used if a hametz-free version is unavailable. Consult your doctor. In all cases, capsules are preferable. Advil, Bayer, Tylenol, Bufferin, Excedrin, Midol, Alka Seltzer, Pepto Bismol, Tums, Keopectate, Valium, Dramamine tablets, Contac, Sinutab, Sudafed, Tetracycline, Erythromycin, Ampicillin, Dimetapp tablets and elixer, Co-Tylenol, among many other drugs, are hametz-free and may be taken on Passover. If you wish to know the name of a hametz-free version of a particular drug, ask Rabbi Rosen. Feeding Pets During Passover: During the year treife [non-kosher] pet food may be brought into kosher homes, so long as the pet food is kept away from the kosher food and utensils. On Passover, the prohibition of owning hametz extends to all hametz products, including dog food, etc. Many pets can be fed a combination of table scraps, canned tuna, farfel, eggs, etc. For some pets, you may wish to consult with your veterinarian. Passov er ser v ices If you have purchased a memorial plaque in our Levin Hall of Remembrance within the last six months, join us during Yizkor on April 27 for the dedication of these plaques with Rabbi Strauss. WHATAREYOUDOINGWITHYOURHAMETZ? The Torah prohibits the ownership of hametz during Pesach. Ridding oneself of hametz is a three-step process: 1. MECHIRAT HAMETZ (SELLING OF HAMETZ) can be arranged anytime up until 10 A.M., Friday, April 19, 2019. The hametz is sold via the Rabbi to a non-Jew in a valid and legal transfer of ownership. At the end of the holiday, the Rabbi arranges for the reversion of ownership. Any hametz that is "sold" must be stored out of sight (and of course, not used), since it technically now "belongs" to the person who bought it. Mechirat Hametz can be arranged through the J.B. Greenfield Chapel, by calling Rabbi Strauss' office, or by mailing-in the coupon found below. 2. BEDIKAT HAMETZ (SEARCHING FOR HAMETZ) takes place this year at sunset on Thursday, April 18. At this time we check that all hametz and hametz products are stored out of sight and that our house is ready for the start of Passover. The search for hametz is traditionally done by the light of a candle, with the assistance of a wooden spoon and feather. It's a beautiful way for parents and children to go through the kitchen and see that everything is really ready for the holiday. 3. Bl 'UR HAMETZ (BURNING OF HAMETZ) takes place no later than 10 A.M. on Friday, April 19, 2019. At this time we burn any hametz which may be found, and which will not be put away, given away or sold. You may also sell your hametz online by going and following this link BETHYESHURUN.ORG/ SELL- YOUR- HAMETZ. At the time you sell your hametz, it is customary to make a charitable donation to the Moes Hittim Fund of Congregation Beth Yeshurun for the benefit of others in our congregation and community who may need help purchasing Passover food. "I hereby appoint Rabbi Brian Strauss to sell all of my hametz and to arrange for its valid and legal sale according to Jewish Law."